Political protests should not happen at the workplace. has the legal right to deny employees political protests while at work. The field is their workplace. The employer sets the rules; it is up to the employee to accept them or not. 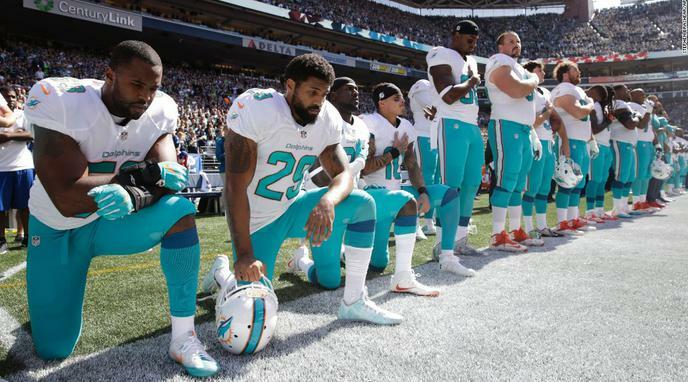 Players have ample opportunity to protest outside of their workplace. Failing to stand is harmful to their company's brand and undermines the justification for the pay they receive. The NFL can't solve the problems that the players are protesting against, so the players should stand, rather than hurt their employer's business. Military advertisements should never happen at the workplace, and the playing of the National Anthem is an advertisement that is paid for by the military for the sole purpose of recruitment. Standing for the Anthem is a political act in itself. If political protests should not happen in the work place then demanding one to stand should not be allowed. Historically, political protests have occurred at workplaces on many occasions. Saying they shouldn't is kind of like saying political protests shouldn't take place. There is something fundamentally different about a workplace in which literally millions of people watch you do your work. It becomes less of a workplace and more of a public forum, where expressions of conscience and censorship take on public significance.